Not so long ago, many believed that people with intellectual disabilities shouldn’t parent children. Read about new attitudes and what advocates recommend to help support these parents. Lindsay Brillhart says that, like anything in life, parenting can be hard at times and easy at others. Ten years ago, when she had her first child, there was a period when parenting was harder. That’s because Brillhart has Asperger’s syndrome, and there wasn’t much support for parents with intellectual disabilities. Today, attitudes have come a long way and when Brillhart had her second child (seven months prior to press time), it was a whole new world. One of the more recent supports Brillhart has taken advantage of is a parenting program that gave her a “pretend baby” and helped walk her through some of the skills she’d be using with a newborn. Brillhart says it helped a lot, adding that the support she receives from her family and her boyfriend has been vital. Brillhart recommends that anyone with an intellectual disability who is considering having children makes sure he or she has as much extra support in place as possible. But until recently, a lot of that support simply didn’t exist. According to Bernadette Irwin, assistant director of PACT, an affiliate of the Kennedy Krieger Institute, parenting as a right for individuals with intellectual disabilities is a relatively new concept. In the last 40 years or so, the attitude toward individuals with intellectual disabilities who desire to be parents has taken a dramatic shift. Instead of viewing it as impossible, a conversation has emerged about ways to make it possible and what needs to be done to put support systems in place. Increased research and attention on the issue of parenting with an intellectual disability has helped contribute to this shift in thought, as has the formation of some organizations with the mission to better support such parents. In 2009, The Association for Successful Parenting was founded with the purpose of formally addressing the needs of parents with intellectual disabilities. In June 2010, the first meeting of the Parents With Development Disabilities/Intellectual Disabilities Task Force was held at the annual American Association of Intellectual and Developmental Disabilities conference. The newly formed task group developed a set of recommendations, including an initiative for more supportive legislation for parents with intellectual or developmental disabilities, an improved coordination between the child welfare and disability systems, and better strengths-based training for psychologists. Irwin says it is these types of efforts that are really shifting the belief system. Over the years, various misunderstandings about intellectual disabilities have led to false presumptions regarding these individuals’ ability to parent. Yuan says another common myth is that parents with intellectual disabilities can’t learn the skills they need to be parents. In reality, they can learn with good teaching, good materials, and a lot of practice. While some of these myths can get in the way of support or even dictate how support is given, disability advocates like Egan urge social workers and other support staff to see past the assumptions. But it’s that need for additional support that can sometimes be misinterpreted as being incapable in what Irwin calls the “child welfare world.” It’s some of the differences between the child welfare world and the “intellectual disability world” that have continued to pose challenges. Yuan says the issues of parenting rights vs. family court challenges essentially require “mediating between two cultures.” The key concept of the child protection culture is “ensuring the safety and welfare of the child,” says Yuan, while in the disability culture, it’s “maximizing the potential of the person for a full life,” which includes the right to parent. Yuan says that, whenever possible, both goals should be worked toward simultaneously. However, she adds, it must be acknowledged that this isn’t always possible. Some myths about parents with intellectual disabilities, including the correlation between IQ and the ability to parent or the idea that parents must be completely independent, have contributed to a high number of parental rights terminations. In a 1991 article in Canadian Psychology, “Parents With Mental Retardation and Their Children: Review of Research Relevant to Professional Practice,” the authors estimated that between 40% and 80% of parents with developmental disabilities (encompassing intellectual disability) permanently lose custody of their child. But Yuan says she’s witnessed proof that even with minimal supports, these parents could successfully raise children. Grant efforts over the course of five years in Vermont have helped build support for parents with intellectual disabilities, resulting in a significantly reduced rate of parental rights terminations. Less than 2% of the parents within the support program lost custody. The problem, Yuan says, is that often the supports put into place for a parent with an intellectual disability are short-term solutions. While these parents typically need only minimal support, they do need it for the longterm. Largely that’s because the children’s needs are ever changing. While there’s been tremendous progress in this arena, there’s still a long way to go with plenty of barriers left to hurdle. Some of the “clashing of cultures” between child welfare and disability advocates certainly creates additional obstacles. Yuan says it’s important to help child protection services better understand the issues related to intellectual disability. In Vermont, disability awareness training was part of the grant-funded effort. Since 2006, family service workers in all districts have received introductory training on supporting parents with disabilities. Some areas about which child welfare agents can typically use better education include IQ and mental age generalizations, the ability of parents with intellectual disability to learn, and dissolving the notion that parents need to do it all on their own. But Yuan says there are issues that are essential for the parent to understand as well, including the constraints on freedom that will become inherent when having a child, the primacy of the child’s needs, and the importance of accepting supports. It’s also important for parents with intellectual disabilities to have some understanding of the perspective of child welfare—that the organization is acting in what is believed to be the child’s best interest. Parents also need to be aware of the importance of maintaining a positive relationship with their case manager, says Yuan. Another challenge has been the self-identification of parents with intellectual disabilities. 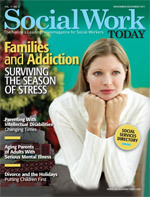 If attempting to work with and support a parent with intellectual disability that hasn’t self-identified this way, Irwin suggests some questions social workers should ask are, “Do you receive SSI?” or “Do you know why you receive SSI?” which may help give an indication of their status or needs. “But you can’t expect the person to self-identify and that can be a barrier to getting paperwork,” she adds. Adding a layer of complication is the fact that many people with intellectual disabilities have a dual diagnosis or other situational challenges. While there’s still a long way to go, there’s no question that the support and rights for parents with intellectual disabilities have already come far. For social workers who may encounter these clients, taking the opportunity to better understand the client and his or her needs can facilitate success. Yuan recommends Step by Step Child Care, a manual by Maurice Feldman and Laurie Case that walks parents with disabilities through child care using photos and descriptions of each step.